WebMD website is a one-stop-shop for your queries related to medical issues and lifestyle. You can find answers to medical conditions; get information of drugs or antibiotics related to the medical conditions, and information on a plethora of lifestyle topics. The website is free for all to use, but there is registration involved. 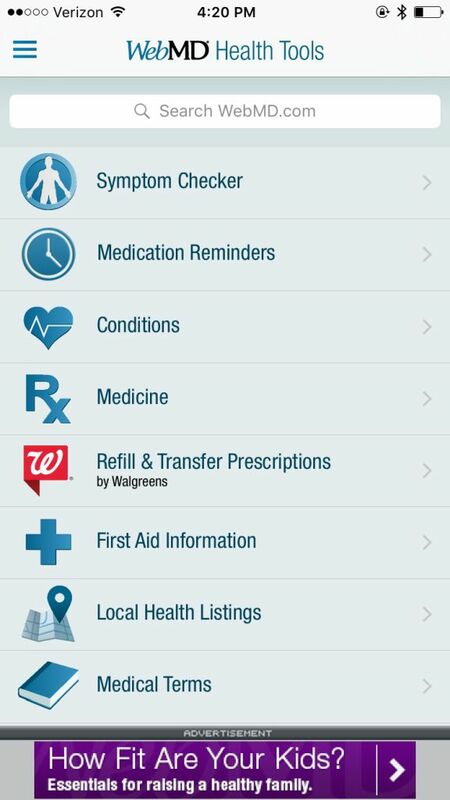 WebMD now has an app that is compatible with iOS. Although the user interface differs for different devices, the things you can learn at WebMD are common to all channels. This feature of WebMD allows users to establish exactly what medical condition you are investigating according to the symptoms they list. Based on severity of your answers, whether to seek medical attention is also presented. The algorithm generates the most likely medical condition. WebMD has a comprehensive database on drug information. The drugs are listed in order and you can search either by the medical term or the generic name of the drug. Information includes warnings, side effects, precautions, and data on overdose or missed dosage. Photos are presented as well. You can find specific information on first-aid required for emergencies, such as allergy or burns, just to name a few. You can add a reminder for medications and also refill prescription from the site. However, you can do that only if you are a Walgreen customer. Based on your interest, you can sign up for many health improvement programs. You can get information on health tips and recommendations for exercise and workouts. You also have access to a tracker that gives you an update. You will find information on food and recipes for a healthy diet as well. Caution: Nothing can replace the evaluation of a real-life health care provider.